Cole, Shannon L. Robinson, Mike J. F. Berridge, Kent C. and McCutcheon, James Edgar 2018. Optogenetic self-stimulation in the nucleus accumbens: D1 reward versus D2 ambivalence. PLOS ONE, Vol. 13, Issue. 11, p. e0207694. Reichard, Rhett A. Subramanian, Suriya Desta, Mikiyas T. Sura, Tej Becker, Mary L. Ghobadi, Comeron W. Parsley, Kenneth P. and Zahm, Daniel S. 2017. Abundant collateralization of temporal lobe projections to the accumbens, bed nucleus of stria terminalis, central amygdala and lateral septum. Brain Structure and Function, Vol. 222, Issue. 4, p. 1971. Kanlikilicer, Pınar Zhang, Die Dragomir, Andrei Akay, Yasemin M. and Akay, Metin 2017. Gene expression profiling of midbrain dopamine neurons upon gestational nicotine exposure. Medical & Biological Engineering & Computing, Vol. 55, Issue. 3, p. 467. Bhaumik, Runa Jenkins, Lisanne M. Gowins, Jennifer R. Jacobs, Rachel H. Barba, Alyssa Bhaumik, Dulal K. and Langenecker, Scott A. 2017. Multivariate pattern analysis strategies in detection of remitted major depressive disorder using resting state functional connectivity. NeuroImage: Clinical, Vol. 16, Issue. , p. 390. Mizuno, Kei Kawatani, Junko Tajima, Kanako Sasaki, Akihiro T. Yoneda, Tetsuya Komi, Masanori Hirai, Toshinori Tomoda, Akemi Joudoi, Takako and Watanabe, Yasuyoshi 2016. Low putamen activity associated with poor reward sensitivity in childhood chronic fatigue syndrome. NeuroImage: Clinical, Vol. 12, Issue. , p. 600. Karlsson, Camilla Aziz, Abdul Maruf Asif Rehman, Faazal Pitcairn, Caleb Barchiesi, Riccardo Barbier, Estelle Wendel Hansen, Mikaela Gehlert, Don Steensland, Pia Heilig, Markus and Thorsell, Annika 2016. Melanin-Concentrating Hormone and Its MCH-1 Receptor: Relationship Between Effects on Alcohol and Caloric Intake. Alcoholism: Clinical and Experimental Research, Vol. 40, Issue. 10, p. 2199. Hidi, Suzanne 2016. Revisiting the Role of Rewards in Motivation and Learning: Implications of Neuroscientific Research. Educational Psychology Review, Vol. 28, Issue. 1, p. 61. Janakiraman, Udaiyappan Manivasagam, Thamilarasan Thenmozhi, Arokiasamy Justin Essa, Musthafa Mohamed Barathidasan, Rajamani SaravanaBabu, Chidambaram Guillemin, Gilles J. Khan, Mohammed A. S. and Sgambato-Faure, Véronique 2016. Influences of Chronic Mild Stress Exposure on Motor, Non-Motor Impairments and Neurochemical Variables in Specific Brain Areas of MPTP/Probenecid Induced Neurotoxicity in Mice. PLOS ONE, Vol. 11, Issue. 1, p. e0146671. West, Charles H.K. Boss-Williams, Katherine A. Ritchie, James C. and Weiss, Jay M. 2016. Reprint of: Locus coeruleus neuronal activity determines proclivity to consume alcohol in a selectively-bred line of rats that readily consumes alcohol. Alcohol, Vol. 50, Issue. , p. 91. West, Charles H.K. Boss-Williams, Katherine A. Ritchie, James C. and Weiss, Jay M. 2015. Locus coeruleus neuronal activity determines proclivity to consume alcohol in a selectively-bred line of rats that readily consumes alcohol. Alcohol, Vol. 49, Issue. 7, p. 691. Guadarrama-Bazante, Irma L. Canseco-Alba, Ana and Rodríguez-Manzo, Gabriela 2014. Dopamine receptors play distinct roles in sexual behavior expression of rats with a different sexual motivational tone. 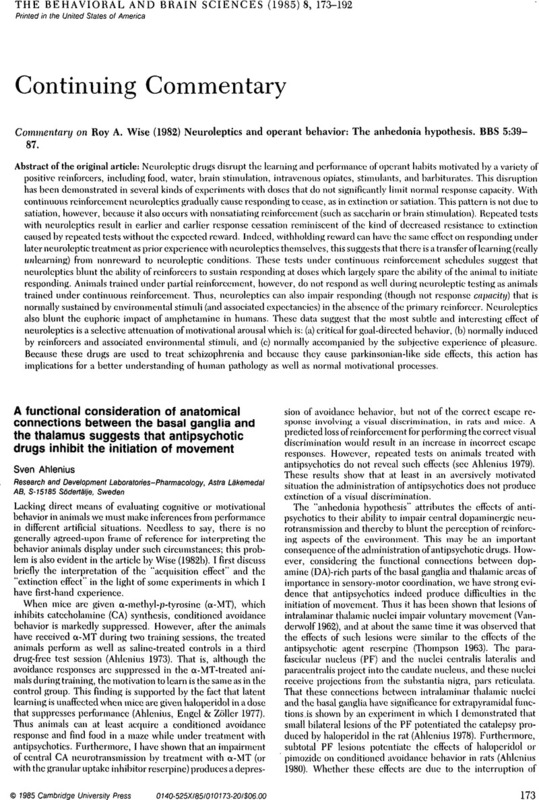 Behavioural Pharmacology, Vol. 25, Issue. 7, p. 684. Olarte-Sánchez, C. M. Valencia-Torres, L. Cassaday, H. J. Bradshaw, C. M. and Szabadi, E. 2013. Effects of SKF-83566 and haloperidol on performance on progressive ratio schedules maintained by sucrose and corn oil reinforcement: quantitative analysis using a new model derived from the Mathematical Principles of Reinforcement (MPR). Psychopharmacology, Vol. 230, Issue. 4, p. 617. Dommett, Eleanor J. and Rostron, Claire L. 2013. Appetitive and consummative responding for liquid sucrose in the spontaneously hypertensive rat model of attention deficit hyperactivity disorder. Behavioural Brain Research, Vol. 238, Issue. , p. 232. Cilia, Roberto 2012. How neurodegeneration, dopamine and maladaptive behavioral learning interact to produce impulse control disorders in Parkinson’s disease. Basal Ganglia, Vol. 2, Issue. 4, p. 195. Berridge, Kent C. 2012. From prediction error to incentive salience: mesolimbic computation of reward motivation. European Journal of Neuroscience, Vol. 35, Issue. 7, p. 1124. Berridge, Kent C. 2012. Contributions of Philip Teitelbaum to affective neuroscience. Behavioural Brain Research, Vol. 231, Issue. 2, p. 396. Bisagno, Veronica Fantegrossi, William E. and Urbano, Francisco J. 2011. Translational Neuroscience. p. 67. Trivedi, Jitendra K and Kar, Sujit 2011. Focus issues in dysthymia. Neuropsychiatry, Vol. 1, Issue. 3, p. 291. Lee, Jun‐Ki and Kwon, Yong‐Ju 2011. Why traditional expository teaching–learning approaches may founder? An experimental examination of neural networks in biology learning. Journal of Biological Education, Vol. 45, Issue. 2, p. 83. Berridge, K.C. 2010. Encyclopedia of Behavioral Neuroscience. p. 100. Gallistel, C. R., Shizgal, P. & Yeomans, J. (1981) A portrait of the substrate for self-stimulation. Psychological Review 88:228–73.